Framed Limited edition Giclee print still available. 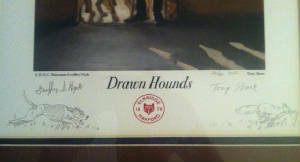 This giclee print is of the painting Drawn Hounds (recently featured on the cover of Covertside magazine). There was an edition of 30 prints. 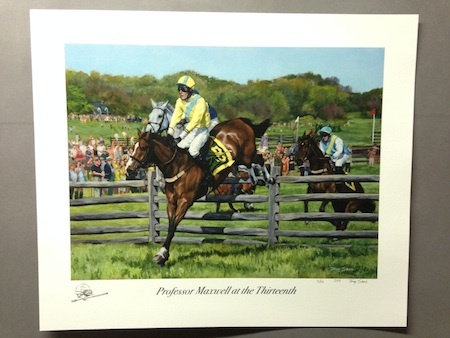 Each print is signed by both the Elkridge Harford Huntsman, Geoffrey Hyde as well as the artist, Tony Shore. Each one has the Elkridge Harford logo and a hand drawn remarque of a hound chasing a fox across the bottom of the page. Each is double matted in a brown faux leather with a classic black wood frame. The image is the same size as the original painting. 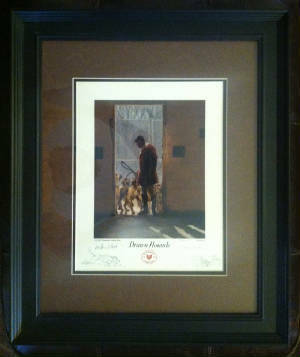 The total size framed is 23 1/2 inches high x 18 1/2 inchs wide. Whether you want to collect this piece of E.H.H.C. 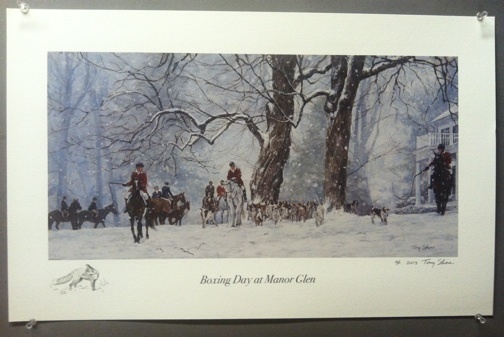 history or are just a fan of the sport of Foxhunting this framed print is a bargain at only $300. + shipping and handling. A portion of the proceeds will be donated to help in the kennels at the Elkridge Harford Hunt Club.